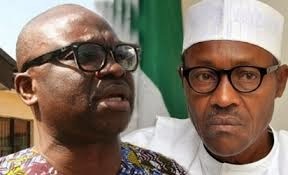 Ekiti State Governor, Mr Ayodele Fayose has said that the All Progressives Congress ( APC ) presidential candidate, Major General Mohammadu Buhari (Rtd) should seek forgiveness (not votes) from Yoruba people of the South-West, including Edo and Delta States. According to the governor, Buhari’s cancellation of the Lagos Metroline project in 1985 was the greatest disservice to the Yoruba people in particular, and Nigerians in general. “If Buhari had not cancelled the Metroline project out of vendetta,transportation problems in Lagos would have been solved permanently. “The Metroline project would have made life easier and changed the face of transport in Lagos. But Buhari cancelled it and even went ahead to pay compensation to the French company that handled it. Buhari’s action cost Lagosians over $78 million then,” Fayose said. Speaking further, the governor said; “In Yorubaland, we were enjoying free education and free health before Buhari came. Then, all that was needed to go to primary and secondary schools was school uniform while drugs were free. “Apart from free education and free health, the South West witnessed rapid development. Lagos State University, Ogun State University (now Olabisi Onabanjo University), Ondo State University (now Ekiti State University), Ondo State Polytechnic (now Rufus Giwa Polytechnic), and several other institutions were established. “As at 1979, Lagos State had no secretariat. Jakande’s government built the Alausa Secretariat within four years. Ajasin’s government built Alagbaka Secretariat in Akure within four years. Even the Lekki-Epe road on which they are now collecting tolls was constructed by Jakande. “For all that they did for us in Yorubaland, what did Buhari do to Jakande, Ajasin, Bola Ige and Bisi Onabanjo? He jailed them and Bisi Onabanjo came out of prison with health issues that eventually claimed his life. “What did Buhari do to reward Awolowo, whose party gave us free education and free health? Awolowo’s international passport was seized and he was prevented from traveling abroad for medical treatment. Awolowo died two years after! “In 1984 that Buhari introduced school fees, thousands of our youths then dropped out of school.